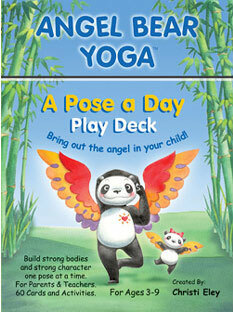 Bring out the angel in your child with this creative yoga card deck! This exciting program allows children time to stretch, relax and learn positive values and character traits. With its creative characters and simple exercises, parents can create their very own angel moments and everlasting bonds with their children. Teachers can bring peace and harmony into the classroom. Anyone can do it - no yoga experience is needed! Each Angel Bear Yoga card includes poses, visualizations, breathing exercises, heart affirmations, angel moments and incentives. 60 cards and activities. Cards are 5 x 7 in size. Kid's educational game and activities included!